When you were on land, it seemed like life aboard the underwater research center was all benefits and no drawbacks. But you should have known. Any sales pitch will maximize pros and minimize cons. Still, you didn’t realize what a lonely life it would be. You thought of scientist collegiality, but it turns out each of the other scientists is just trying to advance his or her own career, leaving you in a cycle of competition with only robots for companions. And octopods. Always octopods. Those things are a nuisance. But even more of a nuisance is how seldom and how meagerly the station’s supplies are restocked and just how precious a commodity time is. This isn’t the good life that Sebastian promised. You should’ve known better than to trust a cartoon lobster. 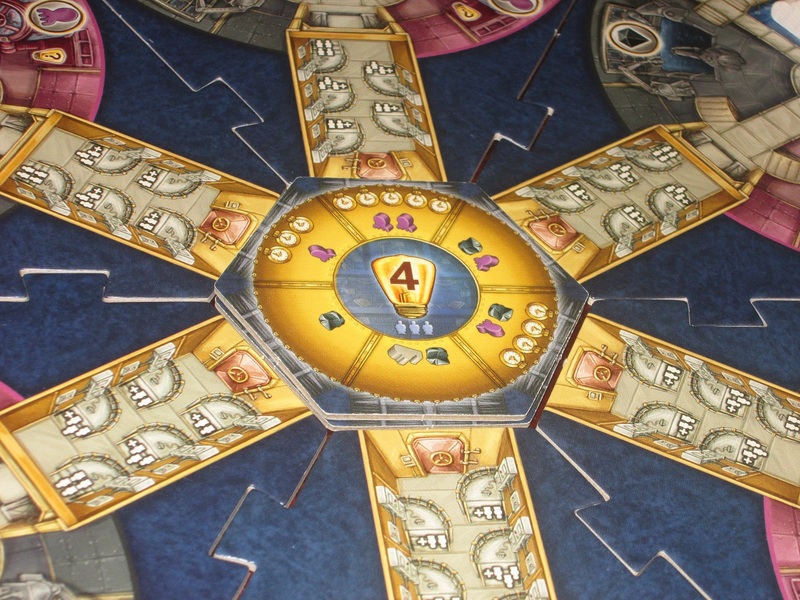 Aquasphere is a point-salad Euro game for two to four players. Players use their engineer and scientist to program and use robots aboard an underwater station. The player with the most knowledge points after four rounds wins. 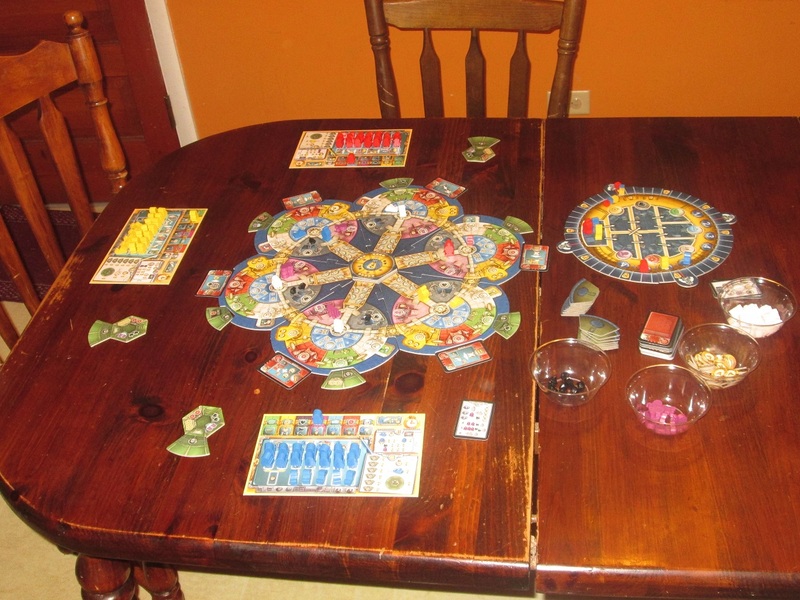 Aquasphere set up for three players. 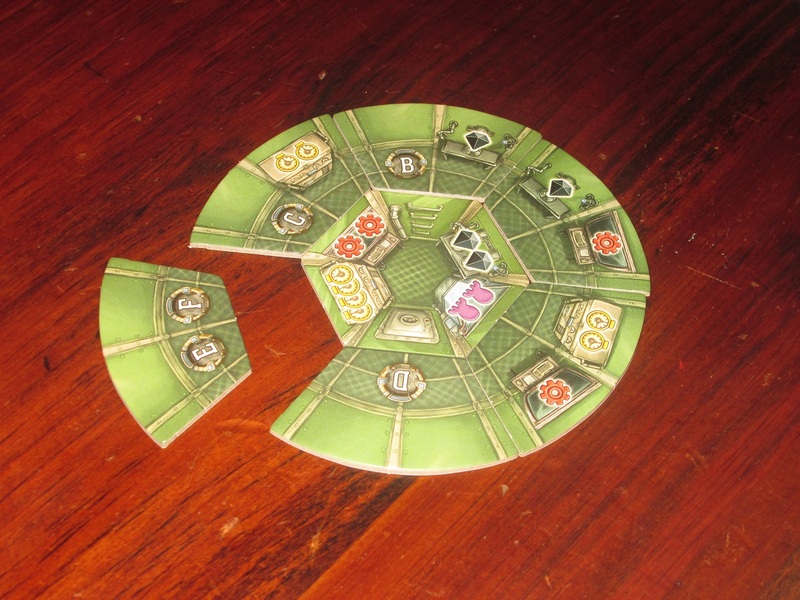 To begin, the sectors of the Aquasphere are assembled randomly. Players receive a starting sector which becomes their base station and place their scientist in this sector. 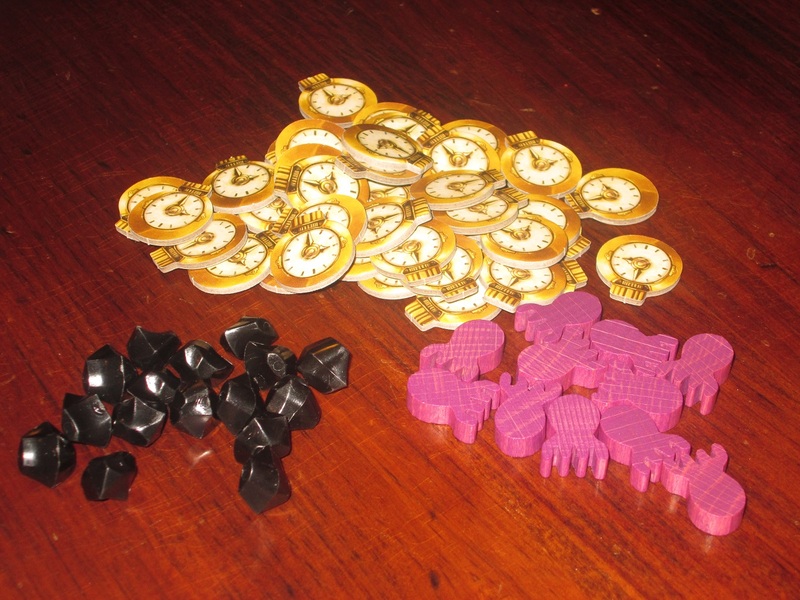 Players seed the Aquasphere with crystals, time tokens, octopods, robots, and submarines according to player count. Each sector receives a card and a base upgrade. Players place their score marker on the starting space of the knowledge points track and their engineer at the bottom of the engineer board. Players select a start player and begin. On a turn, players may either program a robot, deploy a robot, or pass. To program a robot, players move their engineer to one of the two spaces the arrows on the engineer’s current space are pointing at and move a robot from their supply to the action that corresponds to the space where the engineer moves. Alternatively, a player may, once per round, spend 3 time to program a robot for any action. 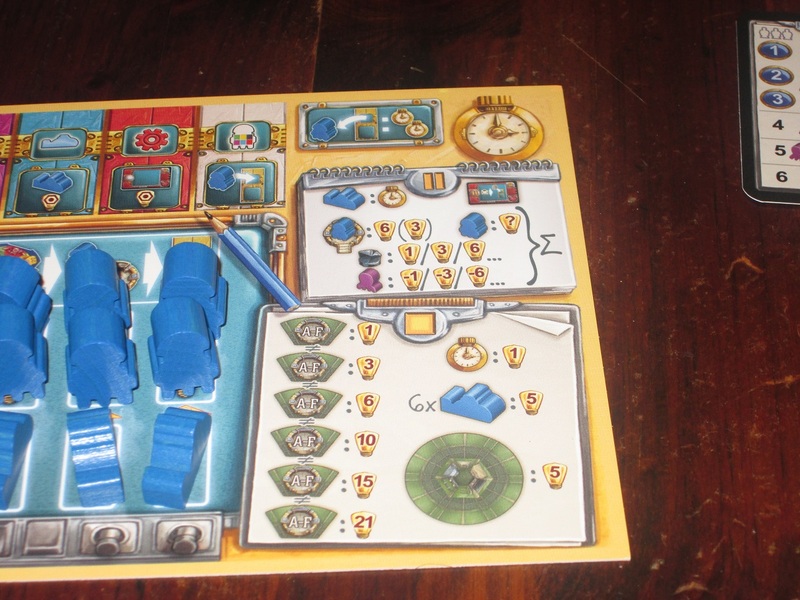 To deploy a robot, a player may first move his or her scientist anywhere in the Aquasphere, paying time to go through airlocks as necessary. Next, the player moves the robot from that action on their board to the control space of the sector where their scientist is and takes the corresponding action in that sector. Actions are taking cards or base upgrades, placing submarines, collecting crystals, destroying octopods, or programming another robot. If there was already a robot in the control space, this robot is placed in the loading bay. If the loading bay surpasses its capacity, each player may only leave one robot in the loading bay, sending the rest back to their supply. 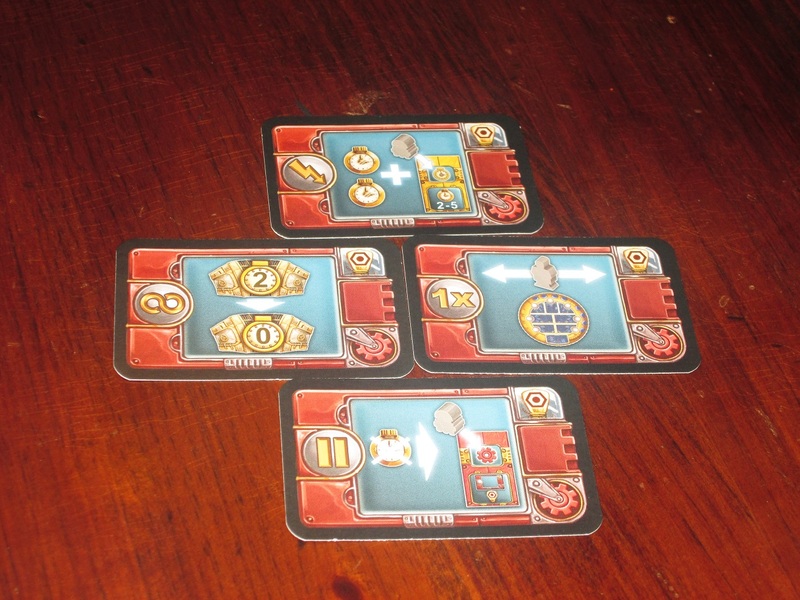 Finally, if there is nowhere else for the engineer to go and the player does not want or is unable to do any other actions, a player passes, moving the engineer to the next available space on next round’s turn order track. Once all players have passed, there is an intermediate scoring. Players get 1 time for each submarine on the station and may use their cards that activate during intermediate scoring. Then players earn points based on controlling the most sectors on the station, how many crystals they have, and how many of their robots are deployed to the station, and they lose points based on how many octopods remain in sectors they control. After intermediate scoring, players replenish the station and reset the engineering board with a new programming path. Players take turns according to the new turn order. 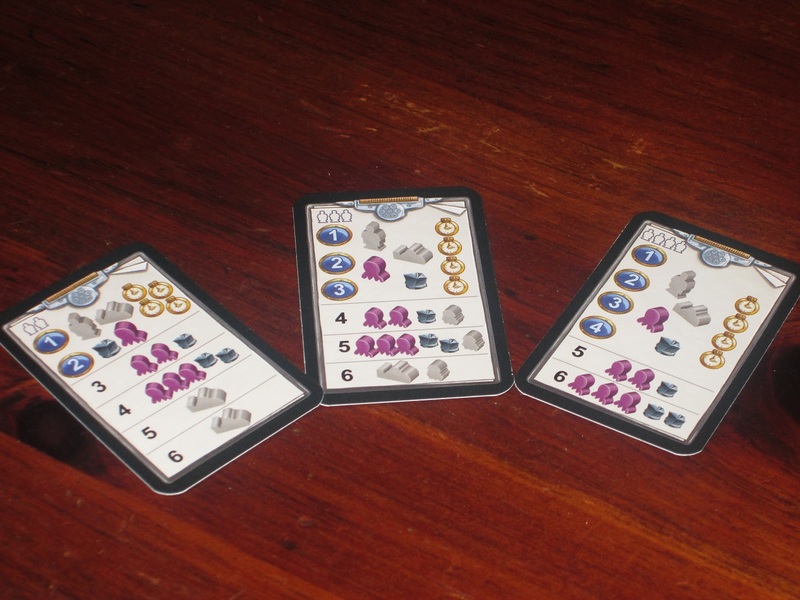 Setup cards are provided with the game for each player count, which makes assembling the Aquasphere a breeze. Players are limited in how much time, how many crystals, and how many cards they can hold, and they are limited in how many octopods they can destroy in an action. Players earn more capacity through collecting sector upgrades. During the game, if players would cross a red line on the score track, they must pay a crystal or remove a programmed robot in order to cross the line (otherwise excess points are lost). After the fourth round’s intermediate scoring, there is a final scoring. Players score points for the number of different letters in their personal base and for completing their personal base with upgrades and for placing all their submarines. Each leftover time is also worth 1 point. The player with the most points wins. Life Would Be Better under the Sea? When we received Aquasphere for review (admittedly, long, long ago), it was the new game from Stefan Feld, and there was great fanfare. The game has since passed through multiple reviewers’ hands, and it is now frequently included in board game clearance sales. 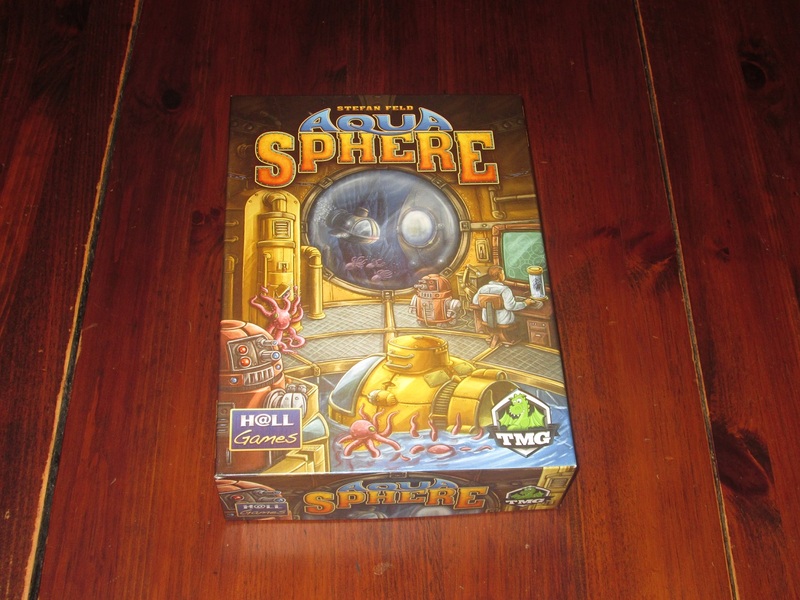 So: now that the shine has worn off and we’re several years down the line, is Aquasphere worth your time and dollars? That depends: are you a Stefan Feld fan? Stefan Feld is a designer that lots of very vocal people love. He’s known for mechanical Euro games that are often complex and referred to as “point salads”: his approach is often that everything you do will score you points; the trick is, how do you eke out more points than the other players? His games are often (merited or not) referred to as multiplayer solitaire, and the enjoyment comes more from interacting with a system than from interacting with the other players. I give you this preamble because I am not typically a Stefan Feld fan. That is, I like his games–I reviewed Rialto and Bruges favorably, and Trajan has become a recent favorite–but with the exception of Trajan, I’m not enamored of his designs and they don’t tend to stick around in my collection. I tend to prefer designs that hew to the “classic” Euro mold like El Grande or, more recently, Concordia: games that, with little rules overhead, foster direct player interaction but without direct player conflict. The mechanics in classic Euros are interesting, but they’re not the main event. They’re simple enough to get out of the way and allow the players to interact in interesting ways. 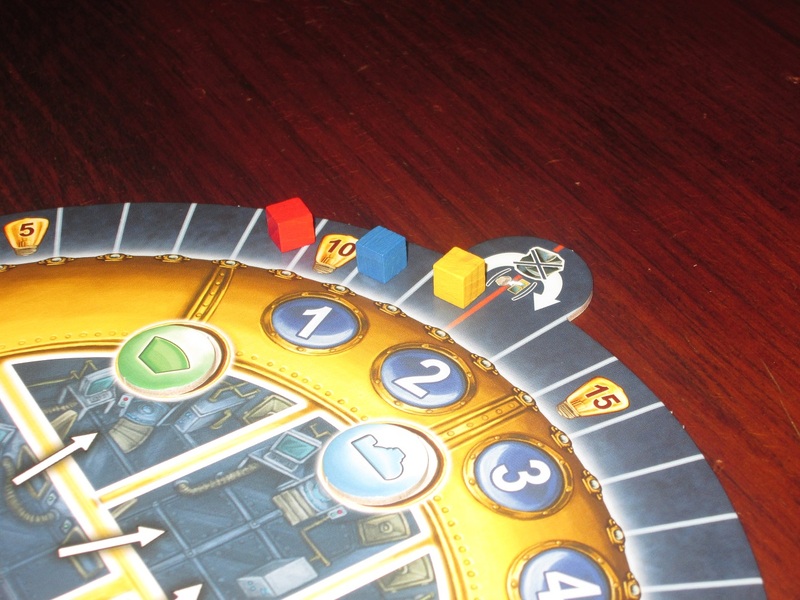 So while I’m not a Feld fanboy, Aquasphere is another of his games that I like–and I think I like it a lot. In fact, it is my second-favorite Feld game (after Trajan). But if you are a Feld fanboy or -girl, you will likely love what’s on offer in Aquasphere. The player board. This takes a little while to set up, and it looks busy, but once you know the rules of the game, the player board is super helpful. Aquasphere’s rulebook is intimidating, and the busy station board makes it look like the rules will be much harder to digest than they actually are. But the game is pretty simple: you will be doing just one of two things until you run out of actions, programming a robot or placing a robot. At the start of the game, you look at the engineering board and think, I’m only going to program three times a round, and there are four rounds–this will be a short game! But this is a Stefan Feld game, and you must take into account that there are extra actions all over the place. 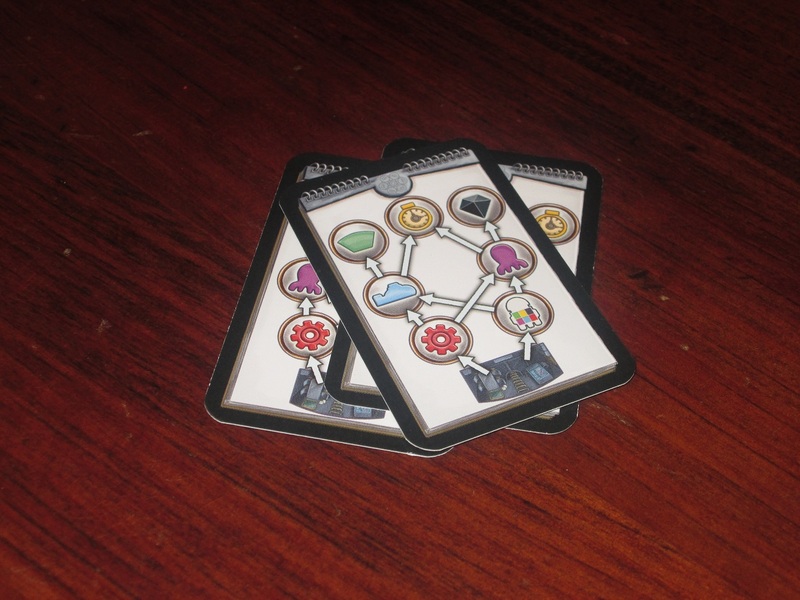 There are several double-sided programming cards that make the engineering board different each round. Extra actions come to you through a few different avenues–a “free program” using time, extra programs through cards, and using the programming action with your robots. Each time I’ve explained the game, I’ve talked about the “program a bot” action, one of the six options for programming a robot. Players have inevitably asked, “Wait–so you program a robot…just to program another robot? Why the extra step?” There are a few limitations and complications that can make these extra programming steps crucial. The board can look a little busy, but it’s easy to read once you know what’s going on. The center tile both says how many points certain actions are worth this round and shows how to set up the next round. For one thing, as players move their engineers along the engineering board, choosing to program a robot for one action necessarily eliminates the possibilities to program it for something else. Engineers can never move laterally (with the exception of an action card), so one avenue is always closed that way; similarly, depending on which path players choose, other options will be closed off to players. So it behooves players, at the start of the round, to decide how they will navigate the engineering board. Program-to-program actions add a back-door to unavailable actions. Incentives can push players in certain directions. For example, cards may offer bonuses to players who choose certain actions. They may not choose certain actions because they have cards that will help them program robots for those actions. Or they may be pursuing certain goals, due to the way they’ve set up their bases or what they need to accomplish in the game, that pushes them along a rigid path. Gaining extra programming actions thus allows players to accomplish things without the engineering board. Player bases are customizable and form a satisfying circle shape once completed. I said that players’ bases can determine which actions are valuable to them, and I like that each player can customize their own base. While the game doesn’t start with player asymmetry, players build up (through their own choices) things that they are good at. They may be able to hold on to extra time–a precious commodity in moving around the station and deploying submarines. They may be able to hold more crystals, which means more points at the end of each round (and more possibilities for breaking through point thresholds). They may be octopod-killing machines, able to remove the annoyances for a big points payout. They may have more slots for powerful card abilities. Or they may simply be striving to score lots of end-game points. I like that this is so varied and that the setup of the game will push players along a different strategic path each game. 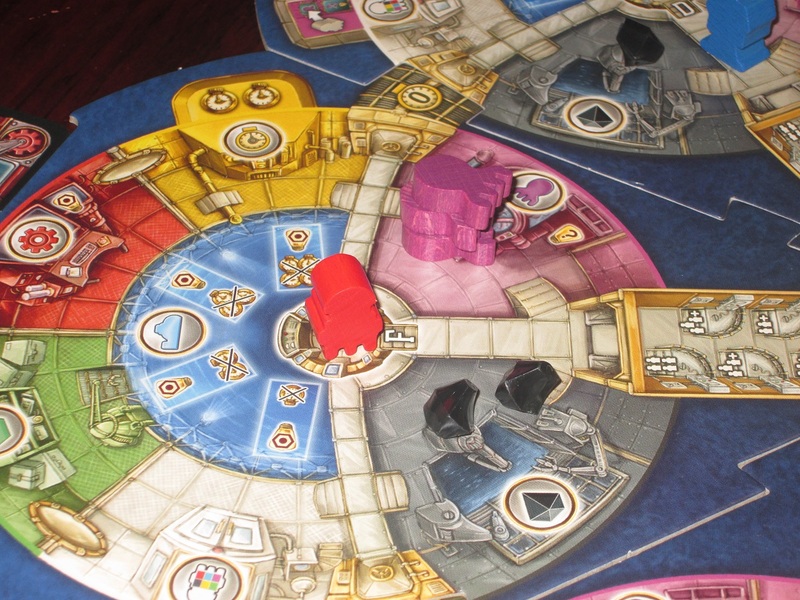 And that’s what I really like about Aquasphere: the intense competition with other players. At the end of each round, the station is restocked with supplies, but these are very limited. In order for players to get the supplies they need, they will have to be the first ones there. Granted, some of this is a matter of being in the right place at the right time (although savvy players can see what’s coming in advance by looking at the center station tile), but much of the game is about timing and snatching the resources you need before another player is able to. Because of the two-step process to getting resources (program a bot and only then perform the action), you can always see what’s coming. But having foreknowledge won’t necessarily get you what you need. Adding to the intense competition is the area control mechanism related to the sectors. And this is another place where timing comes into play. The player who controls the most sectors at the end of the round gets 6 points–nothing to sneeze at. Players control sectors by being the last player to use a robot there. So getting extra programming actions can lengthen your round, potentially placing you in a position to earn this bonus. But there’s a catch: you lose points for every remaining octopod in sectors you control. So that 6-point bonus might not be worth it. There is a handy scoring aid right on the player board. 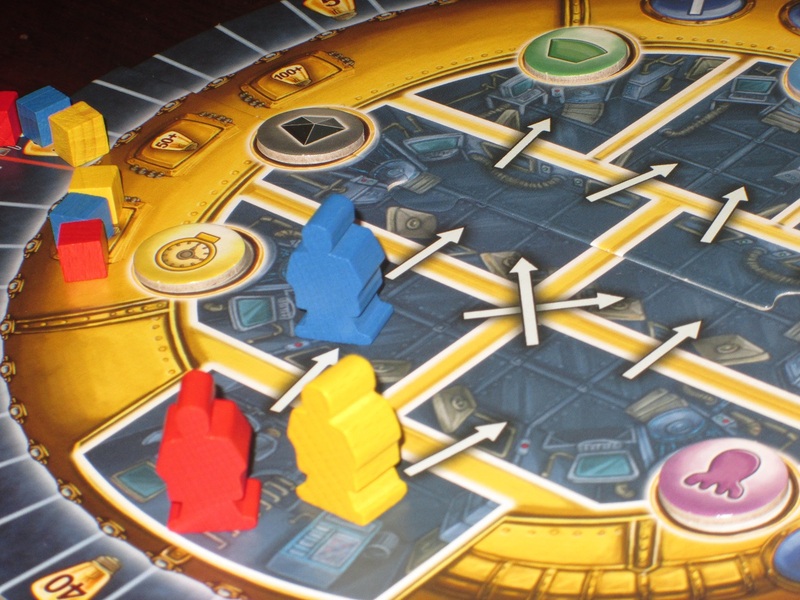 There’s a lot going on in Aquasphere, and there are a lot of concerns to juggle, despite the game’s fairly simple structure. As usual with Stefan Feld designs, Aquasphere can be hard to wrap your mind around because each individual component affects the other components. There are six possible actions for bots to perform in six individual sectors, and each action is so intertwined with the others that it’s no simple task picking your way through the vast array of decisions. For Feld fans, this will be a treat. I like this, too, but the game can bog down in analysis paralysis. As such, I think Aquasphere is not the kind of game to pull out occasionally. While I don’t think you need to devote yourselves to the game fully (as with a CCG or an LCG), it does become richer through experience. The different resources in the game. Time lets you move around the station more freely, get a bonus action during the round, and deploy submarines. Crystals earn players points and allow them to cross point thresholds. Octopods…well, they’re just annoying, but they can score you points (or take them from you). Some of the cards in Aquasphere. These can have immediate benefits, permanent benefits, once-per-round uses, or spend-them-later options. In any case, these are a boon to your strategy. 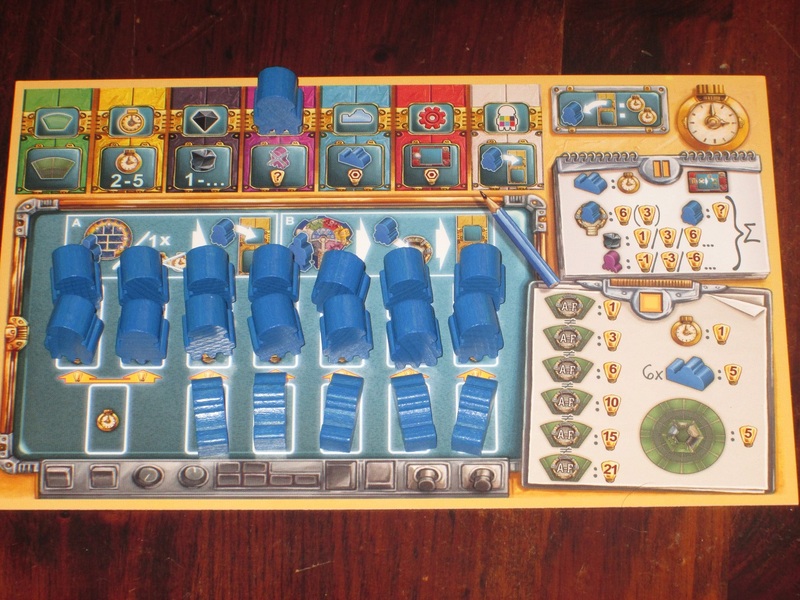 Stefan Feld’s games are sometimes accused of having pasted-on themes, and while I wouldn’t call Aquasphere “thematic”–you don’t really feel like you’re on board an undersea station, and the setting doesn’t reinforce the mechanisms–I do like the window dressings. I’m not typically a fan of Dennis Lohausen’s illustrations, but I love them in Aquasphere. They have a certain charm, and I love the wooden octopod pieces. (They seem so harmless…until they gum up your sectors and steal your points.) The wooden pieces, the vibrant colors, and the well-designed player board all make the game pretty to look at and easy to use. All told, I’m a little baffled by Aquasphere’s ubiquity in the clearance bin. The game is a good one, much better than I expected, and it’s much easier to teach than I thought. I’m not usually crazy about Stefan Feld’s games, but Aquasphere is one I have enjoyed a lot, and I think Stefan Feld’s usual fans will enjoy it even more. I’m not sure about the longevity of the game–again, I’ll see once the novelty of the mechanics wears off–but if your group likes Feld games or just interactive mechanical puzzles and is willing to play a game more than once to explore it, Aquasphere should be a hit. iSlaytheDragon would like to thank Tasty Minstrel Games for providing us with a copy of Aquasphere for review. I read a theory somewhere that once Tom Vasel panned this game in a review that it became unpopular and hit the clearance bin everywhere . That is a shame but I really like Aquasphere and love that I got it so cheap.